Thanksgiving is upon us. I have done little thinking about the food for the meal. As I’m sure many of you are, I’ve been thinking about the tragedies and injustices near and far. My heart aches for the millions who have nowhere safe to be, whether fleeing their home country or homeless on the streets of my hometown. I will get to celebrate and enjoy a meal in a warm cozy house surrounded by family and loved ones. I count my blessings daily. And I think I’ll keep my culinary contributions simple and will support a couple of organizations (here in Portland, OR) who help provide comfort, stability and warmth to those who have the least, such as Streets Roots and Sisters of the Road! 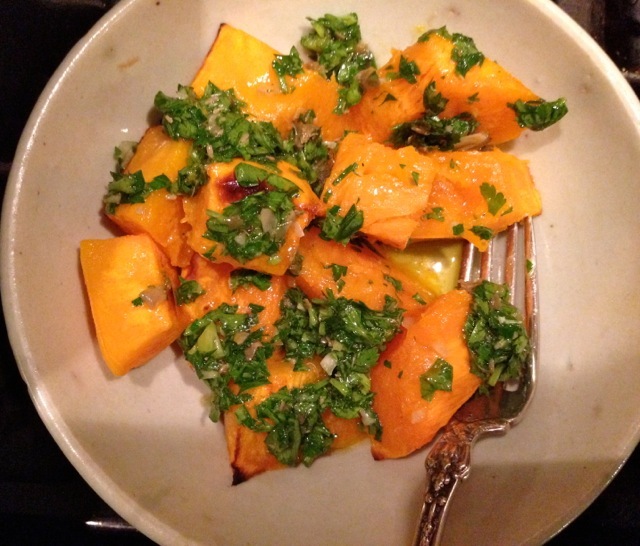 Warm, sweet, roasted squash with a cool, lemony parsley sauce is an easy and beautiful dish. Roast winter squash in a hot oven, 425 – 450 degrees. Roast however much peeled, seeded squash you’d like. I like bite-sized chunks or wedges. Make salsa verde (just a mixture of finely chopped parsley, minced garlic, lemon juice, olive oil and salt) and top the squash with plenty of salsa. Much gratitude for the mindful approach to this season of giving. Sending my holiday best, with a whiff of anticipation for your grandpa’s home made eggnog!